Nifty opened positive but dipped below the previous day’s close within the first few minutes of trade, where the responsive buyers took control to move the index above 6300 level and then stayed in a very narrow range to close at 6304.00, a small gain of 12.90 points. The broader market was positive, with 825 advances to 561 declines. Range for the week stays around 6250-6400. Call option 6400-6700 added 1.42 lacs huge amount of OI with small profit booking seen at 6800 strike price. Put option 6400-6200 added 5.38 lacs huge amount of OI with small profit booking seen at 6000 strike price. 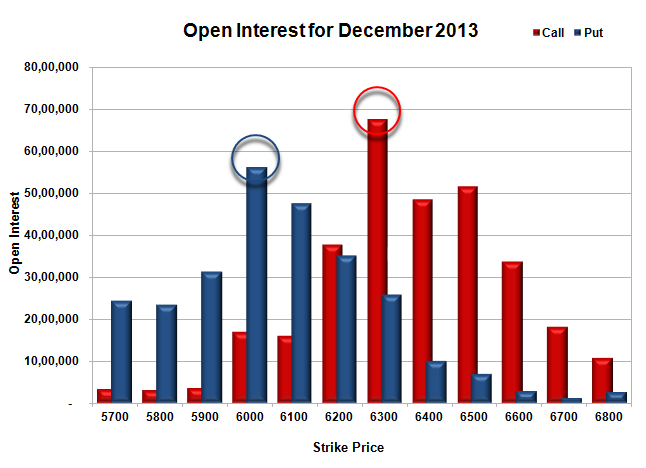 Nifty Open Interest is at 1,97,38,300 up by 4,94,950, with increase in price, most probably huge long build-up. 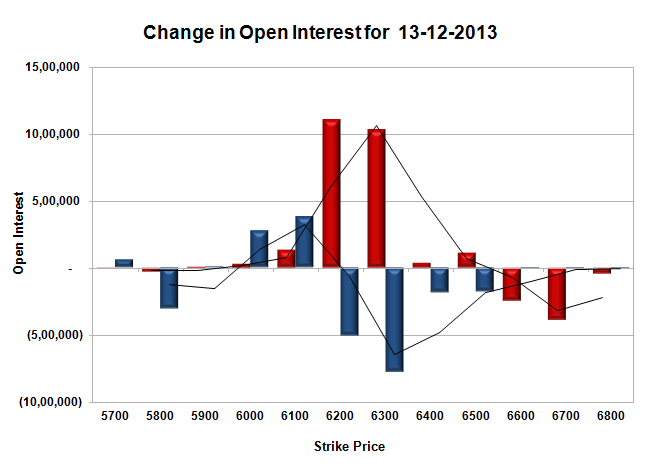 Bank Nifty Open Interest is at 14,24,850 up by 30,225, with increase in price, most probably huge long build-up. FII’s bought small 0.25 lacs Futures, mostly long build-up, as their net OI increased by 9951 contracts (includes 21143 longs and 20640 shorts for the day) and the average price per contract comes to around 6308.86. FII’s future open contract as on date is 437017. PCR Open Interest (Volume) is still below 1 at 0.918. 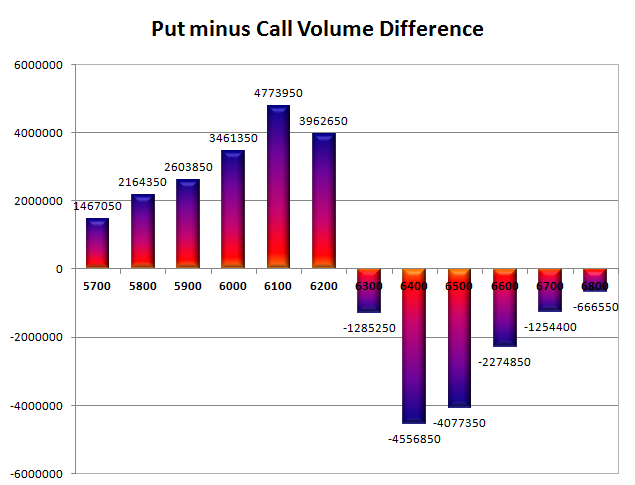 Initial and best support at 6300, with huge OI of 37.97 lacs and below that at 6200 with huge OI of 35.62 lacs. Initial resistance at 6400, with huge OI of 35.36 lacs and above that at 6500, with highest OI of 43.99 lacs. 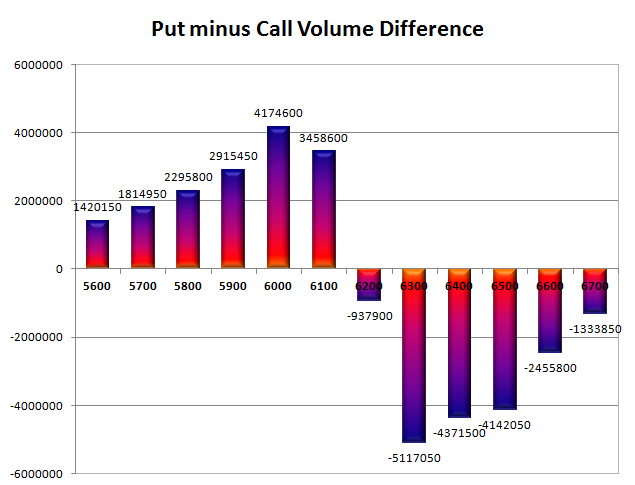 Day Range as per Option Table is 6251 - 6348 and as per VIX is 6254 - 6354 with 6303 as the Pivot. Nifty opened gap-up around 6340 level but was immediately sold off below the previous day’s close and stayed weak throughout the entire session to close at 6291.10, a small loss of 22.70 points. The broader market was flat, with 696 advances to 698 declines. Range for the week stays around 6200-6400. Call option 6300-6700 added 16.56 lacs huge amount of OI with small profit booking seen at 6800 strike price. Put option 6300-6200 added 5.41 lacs huge amount of OI with small short covering seen at 6400 strike price. 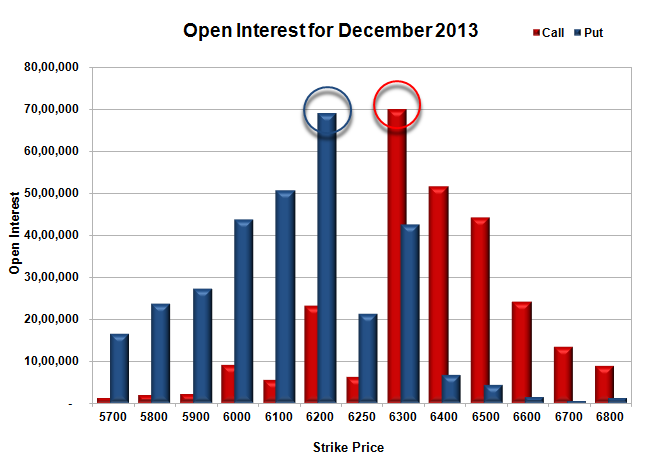 Nifty Open Interest is at 1,92,43,350 down by 4,95,950, with decrease in price, most probably huge long liquidation. Bank Nifty Open Interest is at 13,94,625 down by 8,100, with decrease in price, most probably small long liquidation. FII’s sold small 0.61 lacs Futures, mostly short build-up, as their net OI increased by 2603 contracts (includes 30336 longs and 31561 shorts for the day) and the average price per contract comes to around 6287.76. FII’s future open contract as on date is 427066. PCR Open Interest (Volume) is down to 0.895. 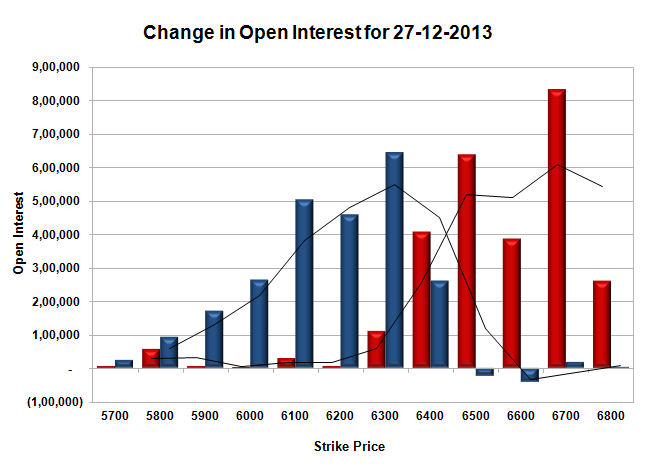 Initial support still intact at 6300, with huge OI of 34.37 lacs and below that at 6200 with huge OI of 34.40 lacs. Initial resistance getting better at 6400, with OI now at 34.93 lacs and above that at 6500, with highest OI of 43.92 lacs. 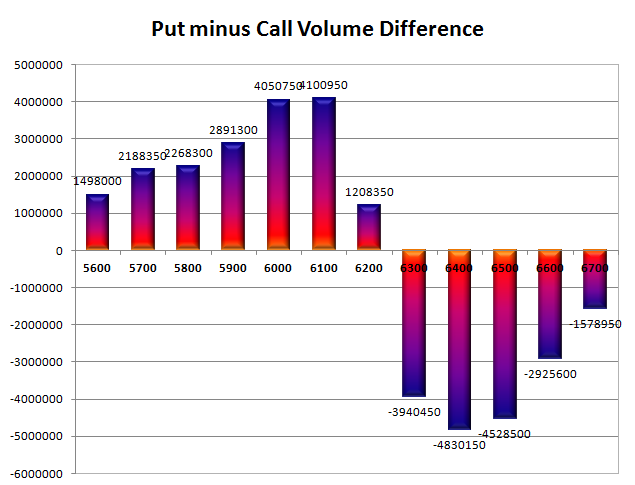 Day Range as per Option Table is 6250 - 6352 and as per VIX is 6241 - 6341 with 6303 as the Pivot. Nifty opened positive and stayed in a very narrow range for second day in a row but with positive bias throughout the entire session to close at 6313.80, gain of 34.90 points. On a week on week basis the index gained 39.55 points or around 0.63%. The broader market was positive, with 767 advances to 614 declines. Developing Range for the next week comes to around 6200-6500. Call option 6300-6800 added 26.31 lacs huge amount of OI. Put option 6400-5800 added 23.93 lacs huge amount of OI with small short covering seen at 6500 and above strike prices. 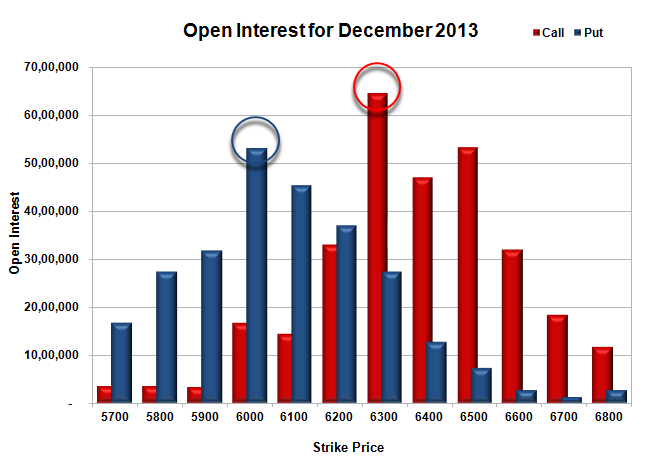 Nifty Open Interest is at 1,97,39,300 up by 7,86,650, with increase in price, most probably huge long build-up. 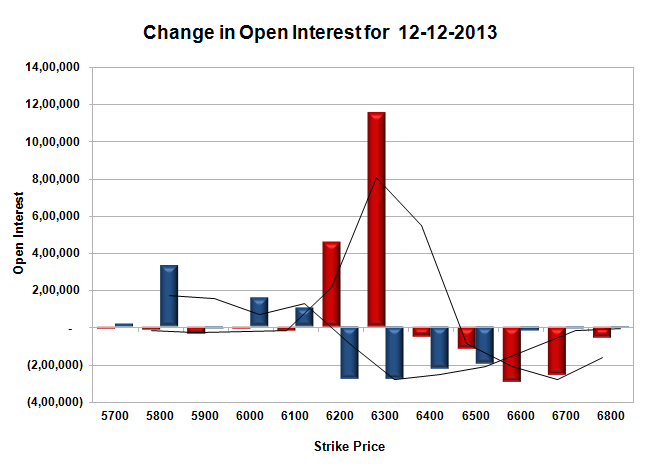 Bank Nifty Open Interest is at 14,02,725 up by 91,125, with increase in price, most probably huge long build-up. FII’s bought 4.52 lacs Futures, mostly long build-up, as their net OI increased by 10104 contracts (includes 23592 longs and 14544 shorts for the day) and the average price per contract comes to around 6326.89. FII’s future open contract as on date is 424463. PCR Open Interest (Volume) is still at 0.928. Initial support still at 6300, with huge OI of 31.34 lacs and below that at 6200 with huge OI of 32.03 lacs. 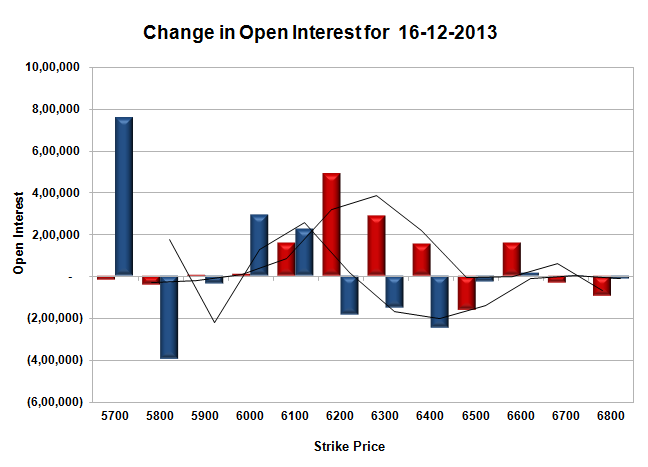 Initial resistance still at 6400, with OI of 31.15 lacs and above that at 6500, with highest OI of 38.65 lacs. 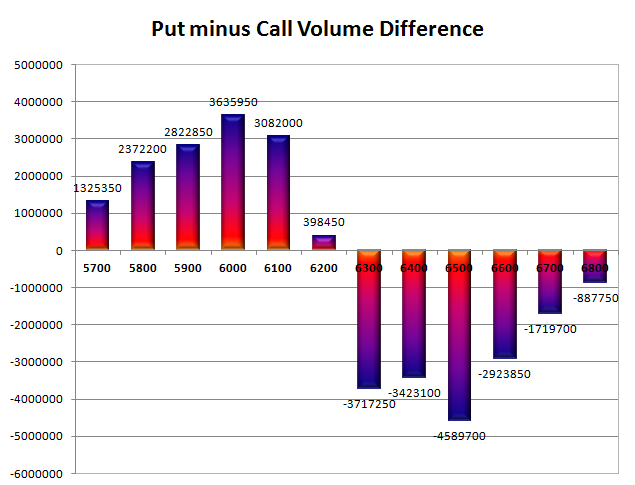 Day Range as per Option Table is 6261 - 6362 and as per VIX is 6265 - 6362 with 6309 as the Pivot. Nifty opened flat to positive and stayed in a very narrow range of 20 points for the better part of the day with small range extension happening during the last 30 min, but closing flat at 6278.90, a small gain of 10.50 points. The broader market was very strong, with 936 advances to 453 declines. Developing Range at the start of the series is 6100-6500. Call option 6000-6800 added 38.06 lacs huge amount of OI. Put option 6800-6000 added 36.65 lacs huge amount of OI. Nifty Open Interest is at 1,89,52,650 up by huge 30,04,550, with small increase in price, 100% rollover from previous series with some long build-up. Bank Nifty Open Interest is at 13,11,600 up by 4,66,250, with increase in price, mostly rollover with small short covering in previous series. FII’s bought 10.98 lacs Futures, mostly short covering, as their net OI decreased by 250672 contracts (includes 173122 longs and 151171 shorts for the day) and the average price per contract comes to around 6299.80. FII’s future open contract as on date is 414359. 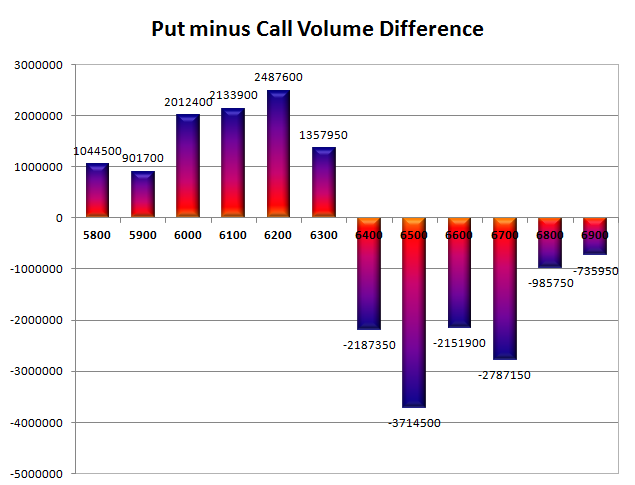 PCR Open Interest (Volume) at start of series is weak at 0.928. Initial support at 6300, with huge addition for the day at 8.92 lacs and below that at 6200 with huge OI of 27.45 lacs. 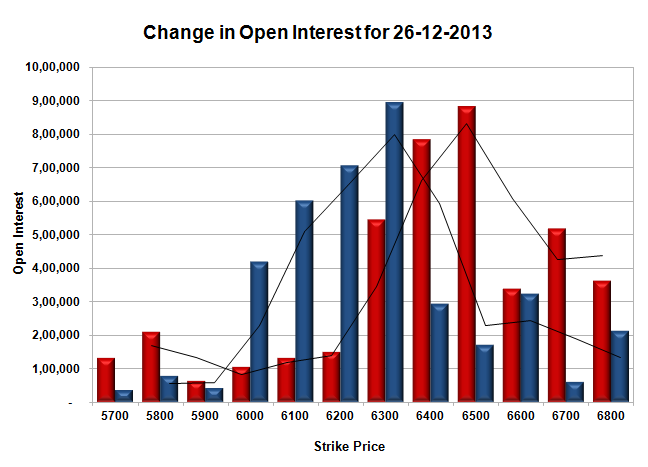 Initial resistance at 6400, with OI of 27.08 lacs and above that at 6500, with highest OI of 32.28 lacs. 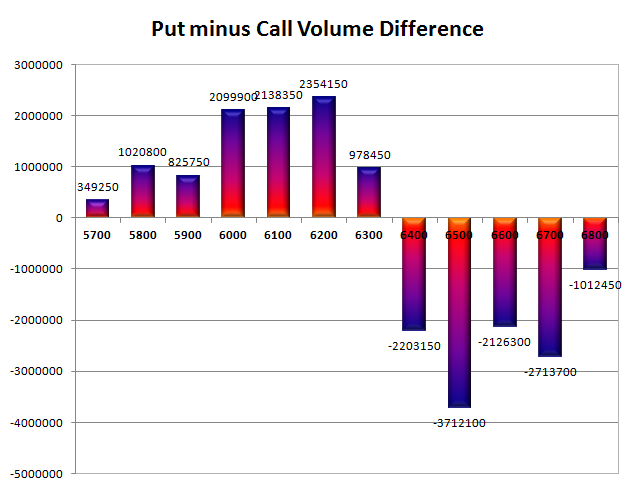 Day Range as per Option Table is 6227 - 6334 and as per VIX is 6230 - 6328 with 6280 as the Pivot. Nifty opened flat to positive and stayed in a narrow range for the better part of the day with positive bias, but a small sell-off towards the end saw the index move below the previous day’s close but moved up to shut shop at 6284.50, a small gain of 10.25 points. The broader market was strong, with 902 advances to 476 declines. Range till expiry has come down to 6220-6350. 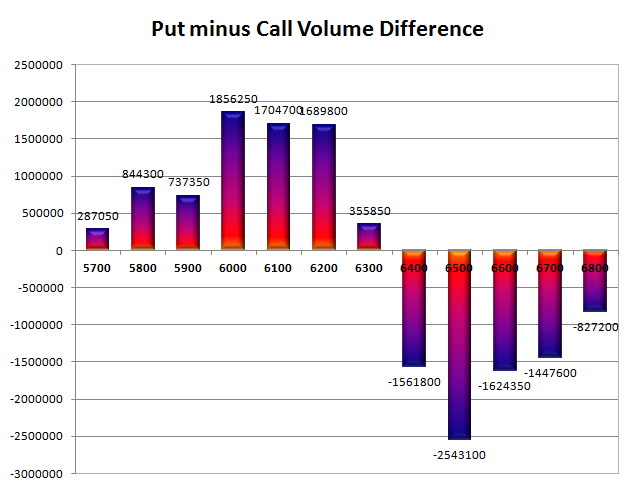 Call option 6400 added 6.61 lacs huge amount of OI with short covering was seen at 6200 and below strike prices. Put option 6400-6200 added 12.42 lacs huge amount of OI with profit booking seen at 6100 and lower strike prices. Nifty Open Interest is at 1,33,73,950 down by huge 49,97,200, whereas Jan series added 52.49 lacs OI with increase in price, 100% rollover with some long build-up. Bank Nifty Open Interest is at 11,90,675 down by 1,69,525, whereas Jan series added 2.06 lacs with increase in price, 100% rollover with huge long build-up. FII’s bought 8.25 lacs Futures, mostly long build-up, as their net OI increased by 4158 contracts (includes 199988 longs and 183496 shorts for the day) and the average price per contract comes to around 6279.99. FII’s future open contract as on date is 620668. PCR Open Interest (Volume) is at the highs of the series at 1.311. 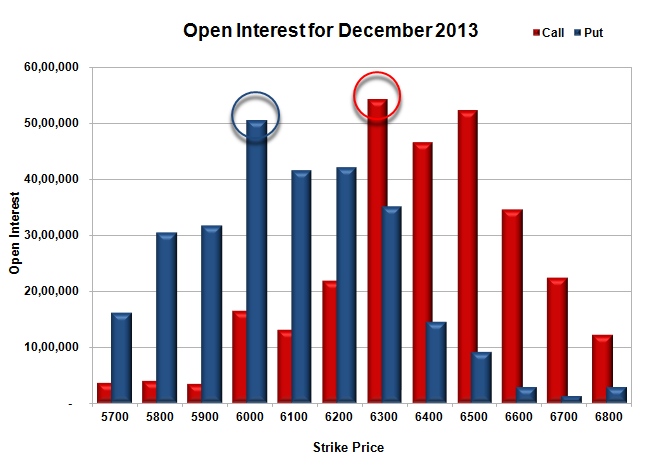 Initial and best support at 6200, with highest OI of 67.18 lacs and below that at 6100 with huge OI of 54.50 lacs. Initial and best resistance still at 6300, with huge OI of 60.09 lacs and above that at 6400, with OI of 54.78 lacs. 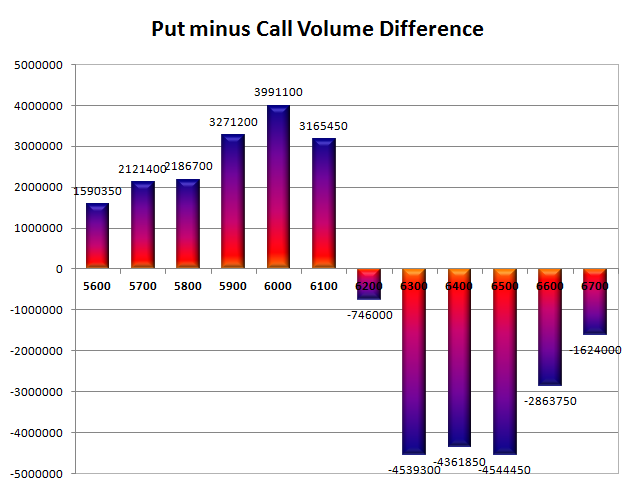 Day Range as per Option Table is 6225 - 6350 and as per VIX is 6231 - 6338 with 6290 as the Pivot. Nifty opened flat but saw the Buyers take control to scale one level after another to end the day near the highs at 6274.25, a huge gain of 107.60 points. On a week-on-week basis the index gained 105.85 points or around 1.72%. The broader market was also strong, with 933 advances to 406 declines. Range has boiled down to 6150-6350. No Call option addition was seen though short covering was seen at 6300 and below strike prices. Put option 6300-6100 added 41.50 lacs huge amount of OI with profit booking seen at 6000 and lower strike prices. Nifty Open Interest is at 1,83,71,150 down by huge 6,00,050, whereas Jan series added 20.93 lacs OI with increase in price, 100% rollover with huge long build-up. Bank Nifty Open Interest is at 13,60,200 down by 1,10,525, whereas Jan series added 0.21 lacs with increase in price, small rollover with huge short covering. FII’s bought 5.46 lacs Futures, mostly long build-up, as their net OI increased by 32014 contracts (includes 101170 longs and 90256 shorts for the day) and the average price per contract comes to around 6256.56. FII’s future open contract as on date is 616510. PCR Open Interest (Volume) is near the high point of the last few days at 1.237. 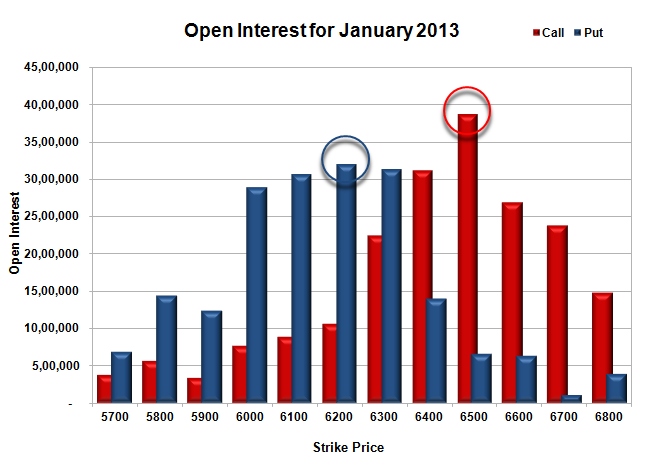 Initial and best support now at 6200, with highest OI of 66.75 lacs and below that at 6100 with huge OI of 60.88 lacs. 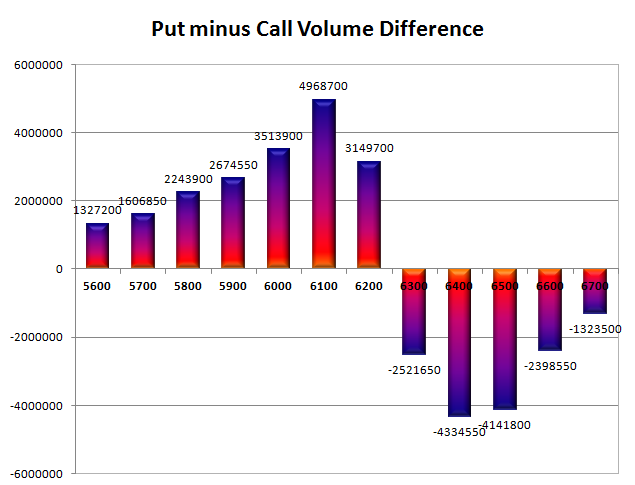 Initial and best resistance at 6300, with huge OI of 64.86 lacs and above that at 6400, with OI of 48.17 lacs. 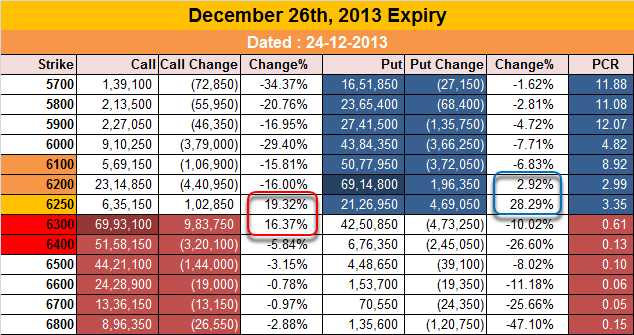 Day Range as per Option Table is 6188 - 6314 and as per VIX is 6222 - 6327 with 6243 as the Pivot. Nifty opened gap-up above 6250 level, but huge profit booking saw the index hurtling down towards the lows of the day around 6150 within the first few minutes of trade. The index tried to move up but closed just above the day’s low at 6166.65, a huge loss of 50.50 points. The broader market was also weak, with 593 advances to 725 declines. Range remains at 6000-6300. 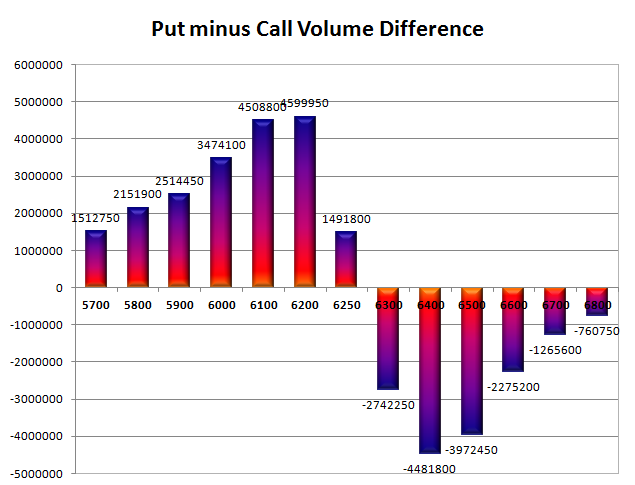 Call option 6100-6300 added 31.50 lacs huge amount of OI with profit booking seen at 6400 and above strike prices. 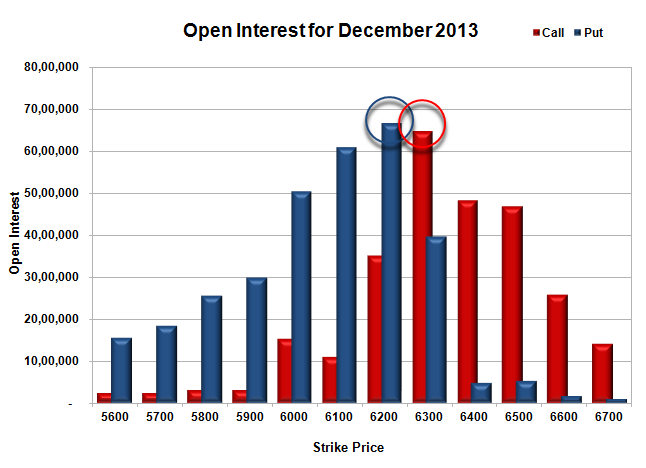 Put option 6000 added 1.12 lacs huge amount of OI with short covering seen at 6200 and above strike prices. 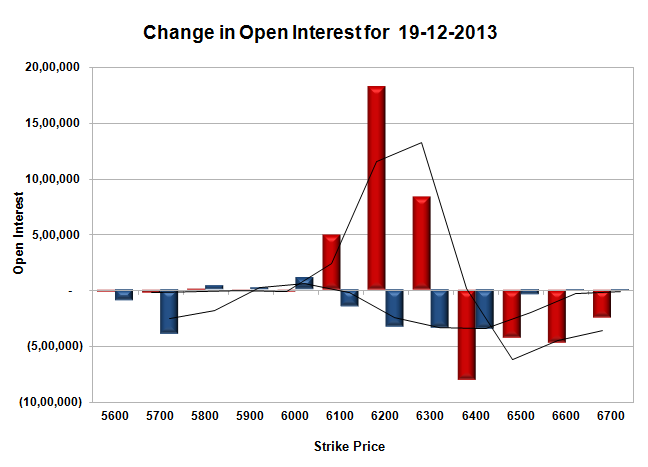 Nifty Open Interest is at 1,89,71,200 down by huge 30,69,100, with decrease in price, mostly long liquidation. Bank Nifty Open Interest is at 14,70,725 down by 10,200, with decrease in price, mostly long liquidation. FII’s sold 9.63 lacs Futures, mostly long liquidation, as their net OI decreased by 45297 contracts (includes 81489 longs and 100740 shorts for the day) and the average price per contract comes to around 6137.80. FII’s future open contract as on date is 584496. PCR Open Interest (Volume) is down to 1.039. Initial support now at 6100, with huge OI of 55.17 lacs and below that at 6000 with huge OI of 57.98 lacs. Initial resistance at 6200, with huge addition for the day at 18.19 lacs and above that at 6300, with highest OI of 76.35 lacs. Day Range as per Option Table is 6129 - 6245 and as per VIX is 6113 - 6220 with 6194 as the Pivot. Nifty opened flat but started to gain momentum within the first few minutes of trade. The RBI governor added fuel to the fire by keeping Repo and CRR both unchanged, which saw the index move to the highs of the day at 6236 but settled a tad lower at 6217.15, a huge gain of 78.10 points. The broader market was also strong, with 896 advances to 441 declines. Range remains at 6000-6300 but the bias is getting bullish. 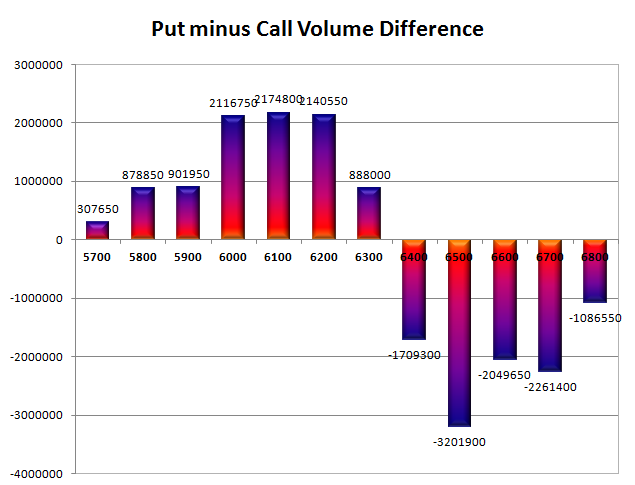 Call option 6400 added 3.89 lacs huge amount of OI with short covering seen at 6200 and below strike prices. Put option 6300-6100 added 23.17 lacs huge amount of OI with profit booking seen at 5900 and below strike prices. 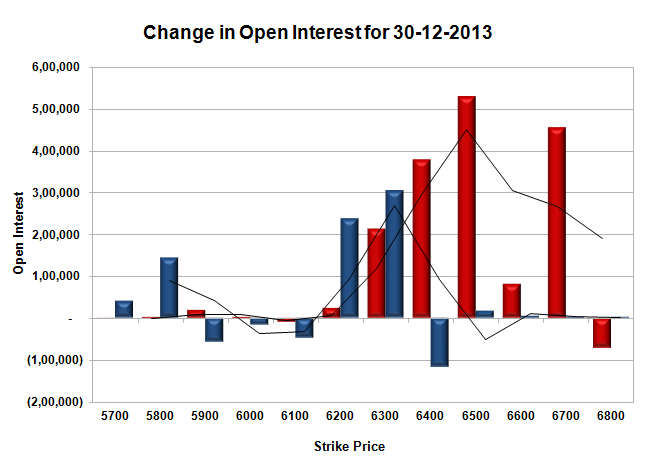 Nifty Open Interest is at 2,20,40,300 up by 1,76,250, with increase in price, mostly long build-up. 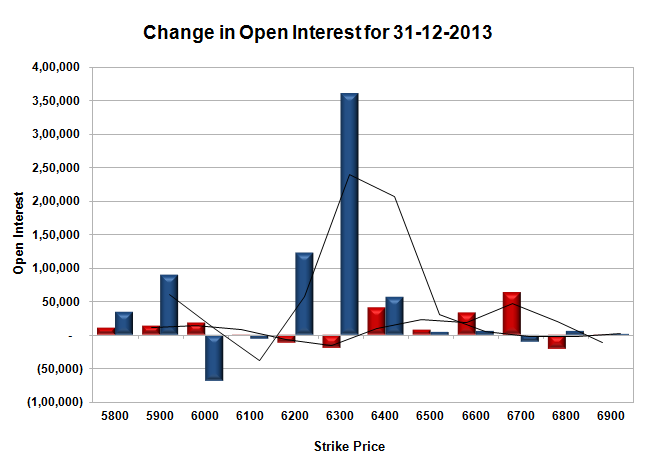 Bank Nifty Open Interest is at 14,80,925 down by 43,950, with increase in price, mostly short covering. FII’s bought 9.01 lacs Futures, mostly long build-up, as their net OI increased by 35790 contracts (includes 84727 longs and 66699 shorts for the day) and the average price per contract comes to around 6217.04. FII’s future open contract as on date is 629793. PCR Open Interest (Volume) is up at 1.109. Initial support back up at 6200, with huge addition for the day at 13.92 lacs and below that at 6100 with huge OI of 56.67 lacs. 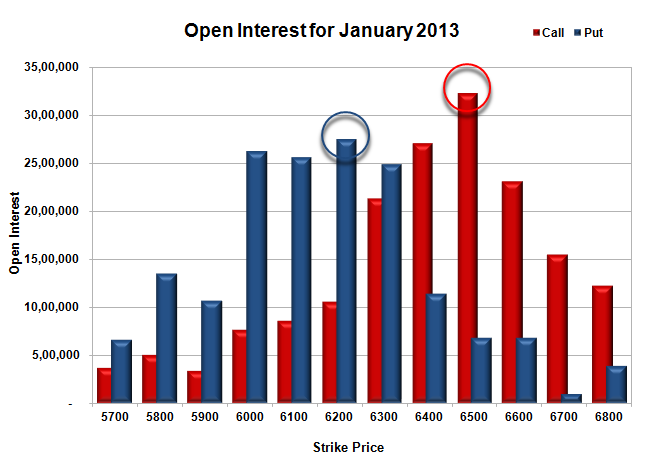 Initial and best resistance at 6300, with highest OI of 67.96 lacs and above that at 6400, with OI of 57.04 lacs. Day Range as per Option Table is 6146 - 6257 and as per VIX is 6160 - 6274 with 6194 as the Pivot. Nifty opened gap-up, but started drifting down from the word go to end around the lows of the day at 6139.05, a small loss of 15.65 points. The broader market was weak, with 608 advances to 731 declines. Range for the next few days is 6000-6300. Call option 6100-6500 added 15.68 lacs huge amount of OI with profit booking seen at 6600 and above strike prices. Put option 6100-5800 added 10.35 lacs huge amount of OI with short covering seen at 6200 and above strike prices. Nifty Open Interest is at 2,18,64,050 down by 5,96,850, with decrease in price, mostly long liquidation. 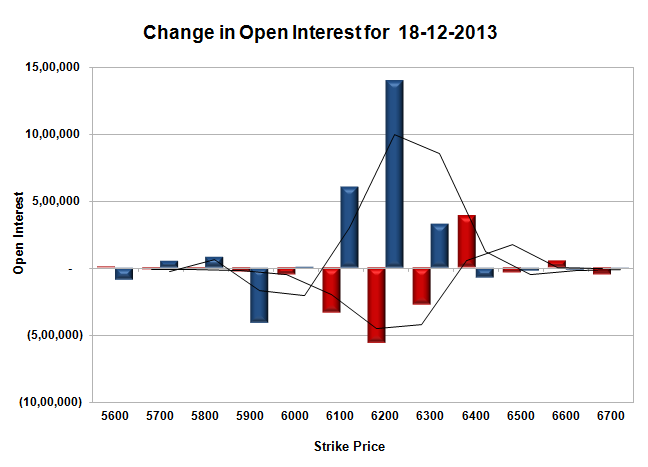 Bank Nifty Open Interest is at 15,24,875 up by 1,10,450, with decrease in price, mostly short build-up. FII’s sold 0.41 lacs Futures, mostly long liquidation, as their net OI decreased by 987 contracts (includes 55403 longs and 56216 shorts for the day) and the average price per contract comes to around 6130.23. FII’s future open contract as on date is 594003. PCR Open Interest (Volume) is at 1.043. 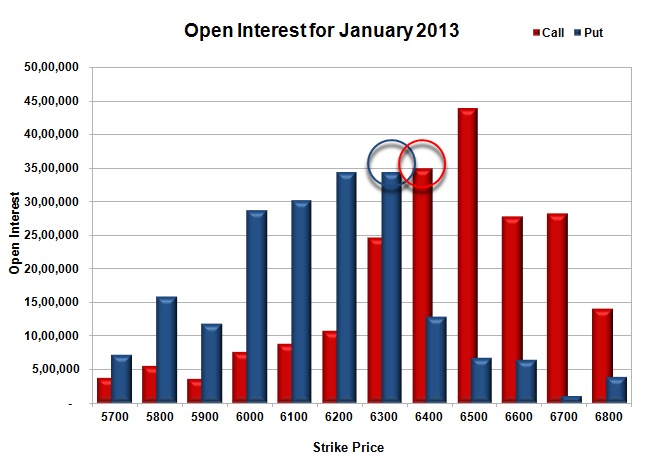 Initial support still very much at 6100, with OI of 50.66 lacs and below that at 6000 with huge OI of 56.82 lacs. Initial resistance getting stronger at 6200, with huge addition for the day at 4.36 lacs and above that at 6300, with highest OI of 70.70 lacs. 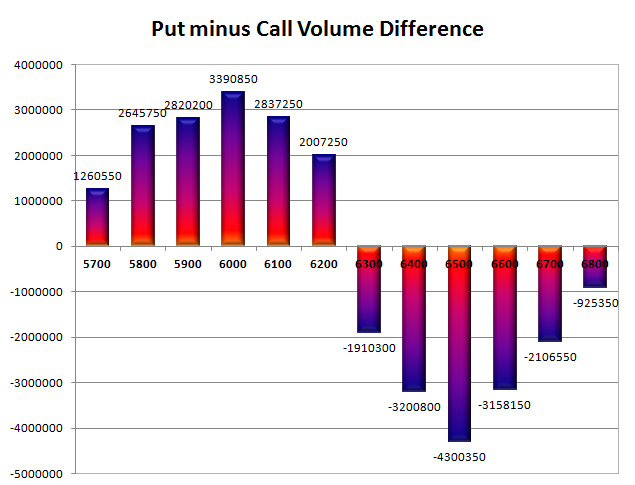 Day Range as per Option Table is 6100 - 6209 and as per VIX is 6080 - 6198 with 61 as the Pivot. Nifty opened flat and stayed in a narrow range for most of the trading session but went on to close near the lows of the day at 6154.70, a small loss of 13.70 points. The broader market was weak, with 557 advances to 757 declines. Range for the next few days is 6000-6300. Call option 6100-6400 added 10.87 lacs huge amount of OI with profit booking seen at 6500 strike price. 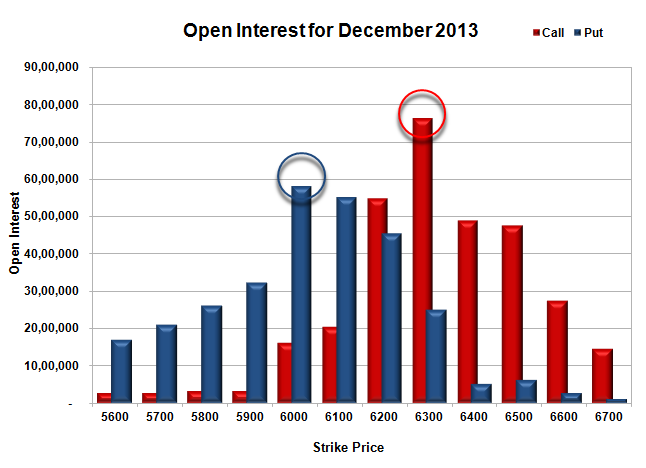 Put option 6100-6000 added 5.22 lacs huge amount of OI with short covering seen at 6200 and above strike prices. 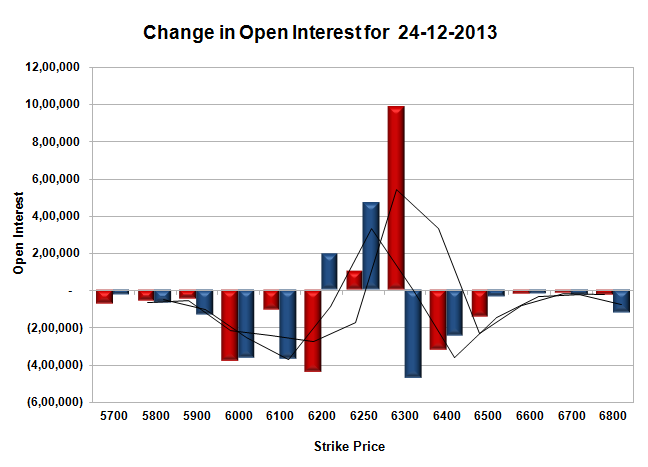 Nifty Open Interest is at 2,24,60,900 up by 4,56,250, with decrease in price, mostly short build-up. Bank Nifty Open Interest is at 14,14,425 down by 34,600, with no change, mostly long liquidation. FII’s sold 9.17 lacs Futures, mostly short build-up, as their net OI increased by 25115 contracts (includes 33039 longs and 51380 shorts for the day) and the average price per contract comes to around 6158.96. FII’s future open contract as on date is 569875. PCR Open Interest (Volume) did not change much and now at 1.053. 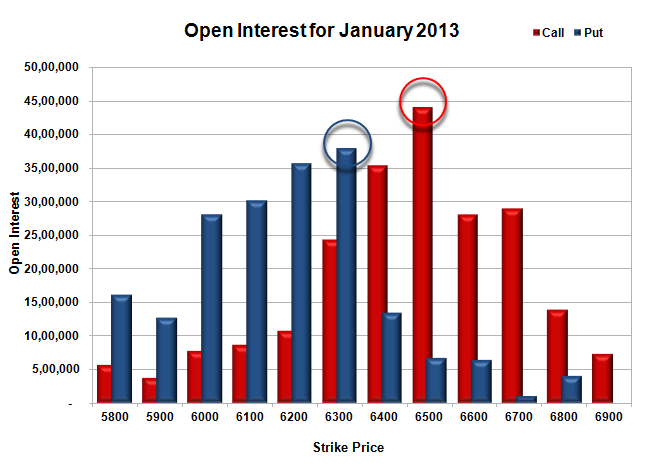 Initial support still at 6100, with OI of 47.64 lacs and below that at 6000 with huge OI of 56.15 lacs. Initial resistance at 6200, with huge addition for the day at 4.88 lacs and above that at 6300, with highest OI of 67.51 lacs. 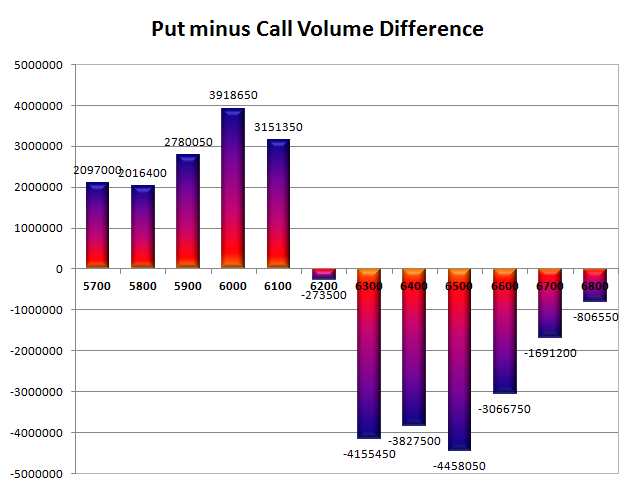 Day Range as per Option Table is 6108 - 6214 and as per VIX is 6096 - 6214 with 6161 as the Pivot. Nifty opened weak around 6200 on the back of bad IIP and CPI data and stayed week to close at the lowest point of the day at 6168.40, a huge loss of 68.65 points. On a week on week basis the index lost 91.50 points or approx 1.46%. The broader market was very weak, with just 334 advances to 1004 declines. Best resistance back at 6300. 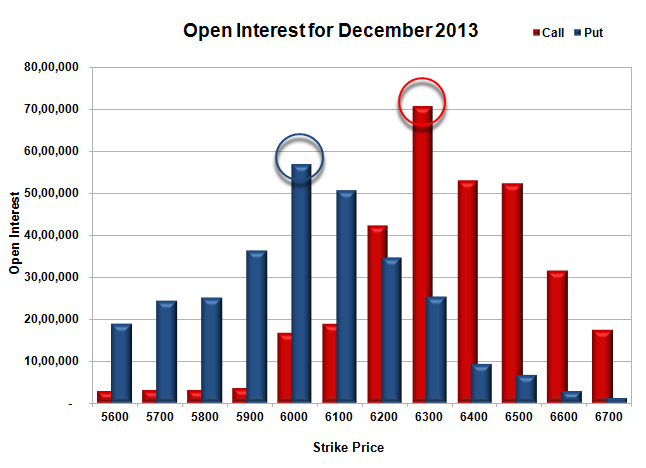 Call option 6100-6500 added 24.12 lacs huge amount of OI with profit booking seen at 6600 and above strike prices. 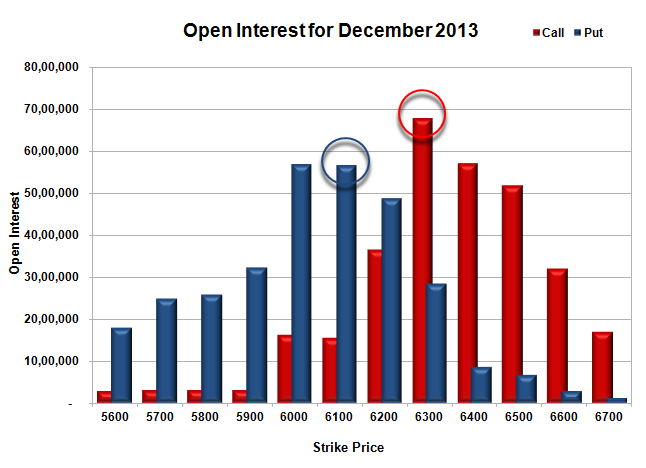 Put option 6100-6000 added 6.55 lacs huge amount of OI with short covering seen at 6300 and above strike prices. 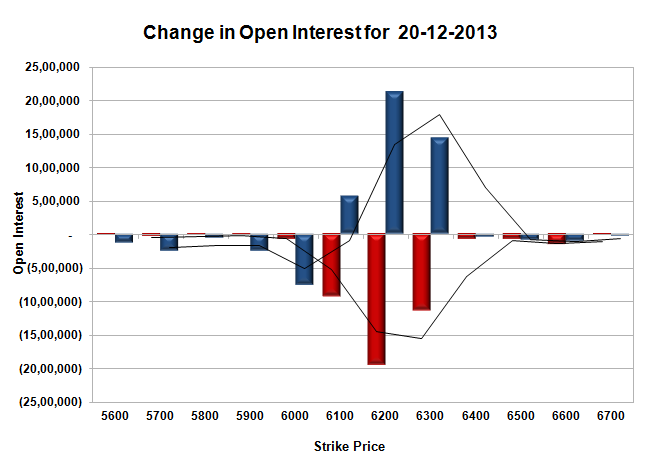 Nifty Open Interest is at 2,20,04,650 down by 2,39,850, with decrease in price, mostly long liquidation. Bank Nifty Open Interest is at 14,49,025 down by 48,525, with decrease in price, mostly long liquidation. FII’s sold 14.81 lacs Futures, mostly long liquidation, as their net OI decreased by 19251 contracts (includes 38762 longs and 68387 shorts for the day) and the average price per contract comes to around 6174.24. PCR Open Interest (Volume) is down again now at 1.050. 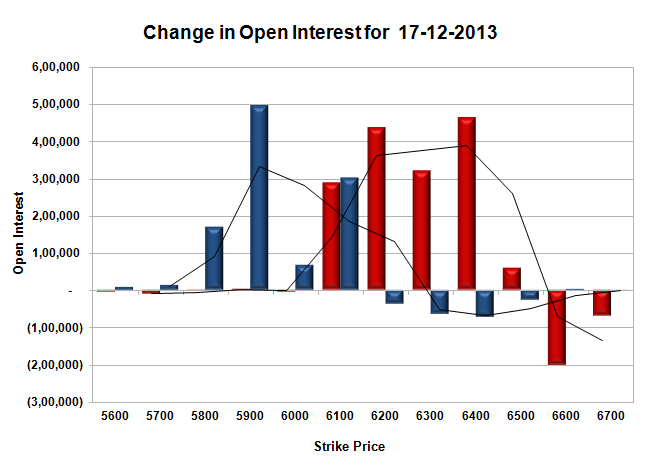 Initial support moved lower at 6100, with OI of 45.36 lacs and below that at 6000 with huge OI of 53.20 lacs. Initial resistance at 6200, with huge addition for the day at 11.02 lacs and above that at 6300, with highest OI of 64.65 lacs. Day Range as per Option Table is 6119 - 6235 and as per VIX is 6111 - 6226 with 6179 as the Pivot. Nifty opened weak below 6300 and stayed weak throughout the entire session with a huge sell-off late afternoon to close at the lowest point of the day at 6237.05, a huge loss of 70.85 points. The broader market was also very weak, with just 483 advances to 844 declines. Best resistance back at 6300. Call option 6200-6300 added 16.11 lacs huge amount of OI with profit booking seen at 6500 and above strike prices. Put option 6100-5800 added 5.79 lacs huge amount of OI with short covering seen at 6300 and above strike prices. 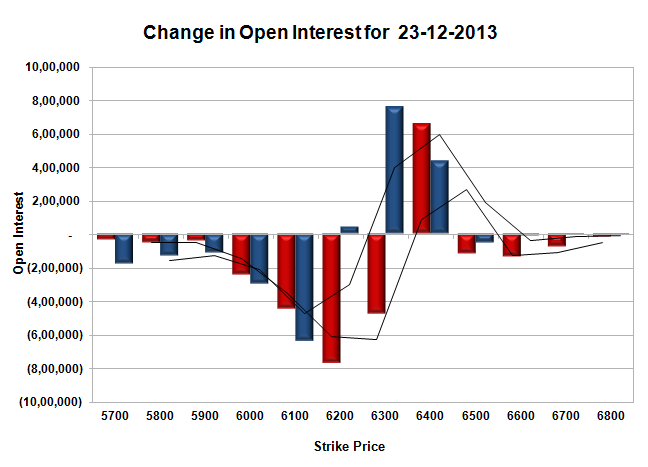 Nifty Open Interest is at 2,22,44,500 up by 2,06,100, with decrease in price, mostly short build-up. Bank Nifty Open Interest is at 15,97,550 down by 93,325, with decrease in price, mostly long liquidation. FII’s sold 8.37 lacs Futures, mostly short build-up, as their net OI increased by 14901 contracts (includes 36607 longs and 53342 shorts for the day) and the average price per contract comes to around 6244.32. FII’s future open contract as on date is 589126. PCR Open Interest (Volume) is down a bit at 1.110. 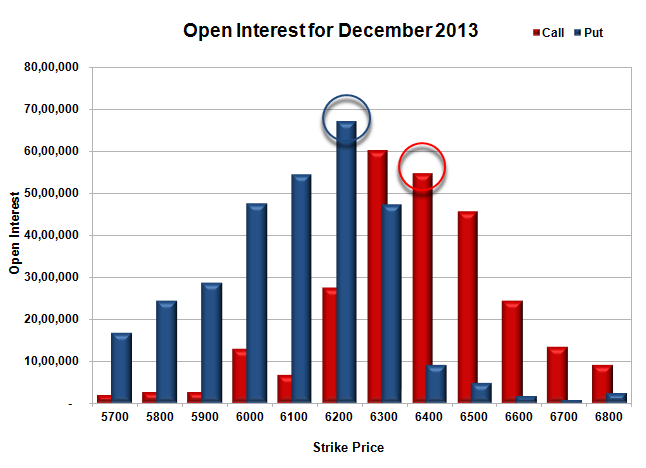 Initial support now at 6200, with OI of 42.05 lacs and below that at 6100 with OI of 41.58 lacs. Initial and best resistance at 6300, with OI highest of 54.33 lacs and above that at 6400, with OI of 46.59 lacs. Day Range as per Option Table is 6191 - 6305 and as per VIX is 6179 - 6295 with 6251 as the Pivot.